The City of San Francisco recently released its Tall Buildings Safety Strategy (TBSS) report outlining recommendations for the seismic safety of both new and existing high-rises. The recommendations are split into several categories–such as actions for reducing seismic risk prior to earthquakes, reducing seismic risk following earthquakes, and improving the City’s understanding of its tall building stock. 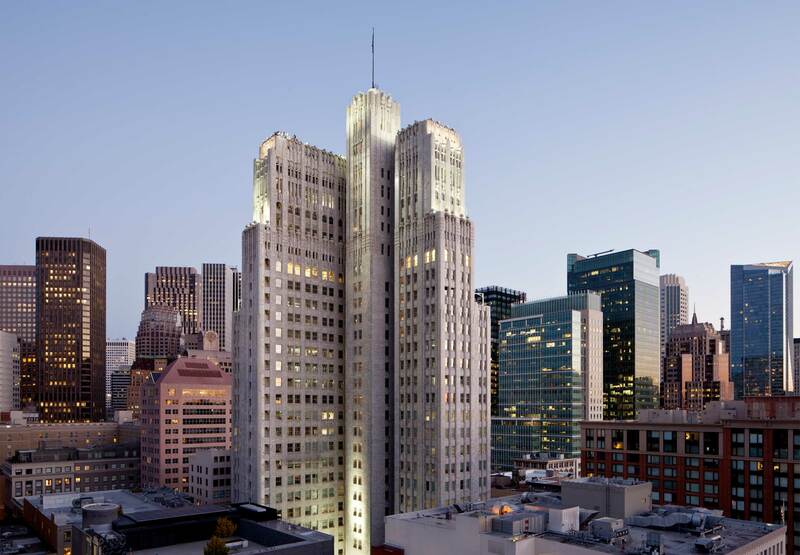 We have reviewed the recommendations outlined in the Tall Building Safety Strategy and agree that they will improve the seismic resilience of tall buildings in San Francisco. While the TBSS report is far reaching and has laid out a road map for more resilient high-rise structures in San Francisco, there are some safety strategies not covered by the report that deserve discussion. We’re shedding light on these additional safety measures for tall buildings that should be considered alongside the TBSS recommendations. Although they were not included in the report, they apply to tall buildings in any earthquake zone. The TBSS would require owners of existing high-rise pre-Northridge moment frame structures in San Francisco to perform a post-earthquake inspection of their buildings. Pre-Northridge moment frame buildings are steel moment frame structures constructed prior to the 1994 Northridge earthquake that have a reputation for brittle failures of beam-to-column connections; the failures of these critical connections are often concealed behind architectural finishes. Following Loma Prieta, the last significant earthquake to hit San Francisco, many of the steel moment frame high-rise buildings in the city were not specifically inspected for the types of damage now known to exhibit themselves in pre-Northridge frames. For this reason, the TBSS recommends that steel high-rise towers that withstood Loma Prieta be inspected for brittle failures using FEMA 352, a post-earthquake inspection guideline using statistical means to project observed damage on a limited sample of beam-column joints over an entire building. We agree with the TBSS recommendation for post-earthquake assessments of pre-Northridge moment frame structures. However, there are some nuances of these types of assessments that warrant consideration. Pre-Northridge high-rise towers may contain 3,000-6,000 moment connections and if the guidelines in FEMA 352 were strictly adhered to, this would require the inspection of hundreds of connections. The cost of a full FEMA 352 inspection will likely amount to hundreds of thousands of dollars. There are many factors that contribute to the expense of these inspections which include (and are not limited to) the removal of asbestos containing fire proofing, lead paint and the impact on building occupants. Holmes Structures has analyzed a number of pre-Northridge steel moment frame high-rise structures in San Francisco using Performance-Based Engineering (PBE) methods. 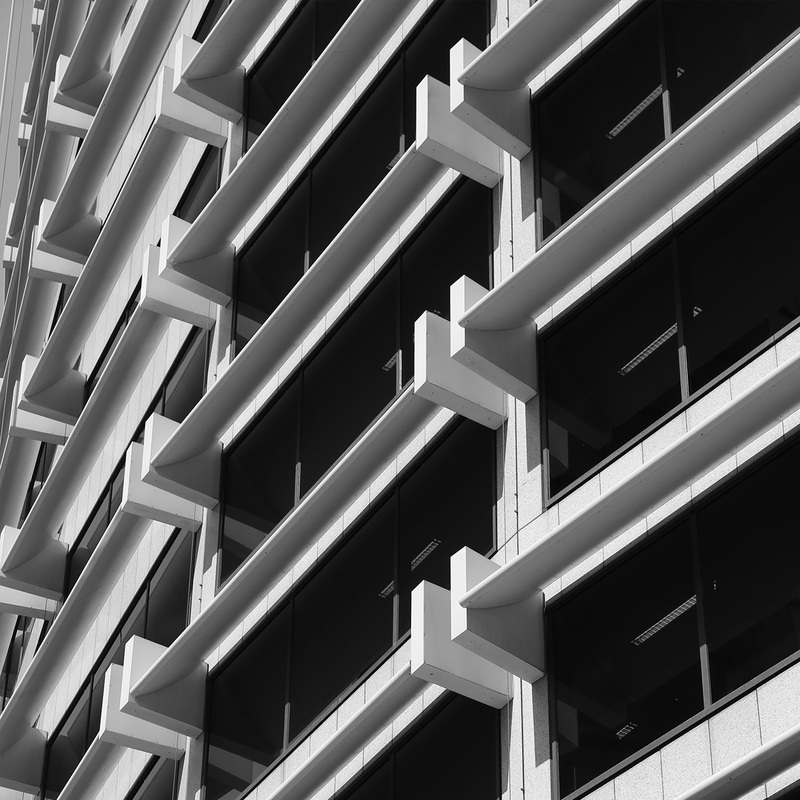 For each of these assessments, we benchmarked a given building’s structural performance through an analytical model of the building that was subjected to the Loma Prieta seismic event. None of the models predicted any damage caused by Loma Prieta. For this reason, San Francisco should consider augmenting the TBSS recommendations for post-earthquake inspection with an allowance for “compliance by analysis” in lieu of detailed and costly inspections. Compliance through analysis should be acceptable as section 3.2 of FEMA 352 would not require a detailed inspection of these types of buildings (since the ground shaking in San Francisco caused by Loma Prieta falls below the trigger level for mandatory inspections). Beyond the financial incentive, there are additional benefits of allowing post-earthquake assessments by analysis for a building owner to explore. Once an analytical model of the building is prepared, it can be used (with relatively little additional effort) to complete a FEMA P58 seismic loss assessment or USRC building rating. These assessments can provide building owners and the City with an estimate of financial loss (including PML) and repair time in addition to an understanding of a structure’s collapse vulnerability in a probabilistic framework. Egress stair safety within high-rise towers was not discussed in the TBSS report. Experiences in the 2011 Canterbury earthquakes in New Zealand have highlighted the risk that egress stair failure can pose to the occupants of high-rise buildings. Notable stair failures occurred in Christchurch buildings, including the Clarendon Tower and the Forsyth Barr building where the egress stairs collapsed and one person was killed in the stair well. The occupants in these buildings were forced to await rescue, stranded as aftershocks rumbled through the city. Fortunately for the trapped occupants, these buildings were only 18 stories tall and rescue by crane was possible. Many of the high-rise buildings in San Francisco are much taller and rescue by crane may not be feasible in the event of a high-magnitude earthquake. We have observed that egress stairs in many existing San Francisco high-rises are not designed to accommodate seismic displacement between floors and therefore are vulnerable to failure during a moderate or larger earthquake. The City of San Francisco should consider augmenting the TBSS report to include a pre-earthquake evaluation of egress stairs within existing high-rise structures, so that a list of buildings with vulnerable stairs can be made available to first responders. Further, The City should encourage building owners to retrofit egress stairs on a voluntary basis, protecting public safety and the first responders that would have to navigate the stairwell after an earthquake. 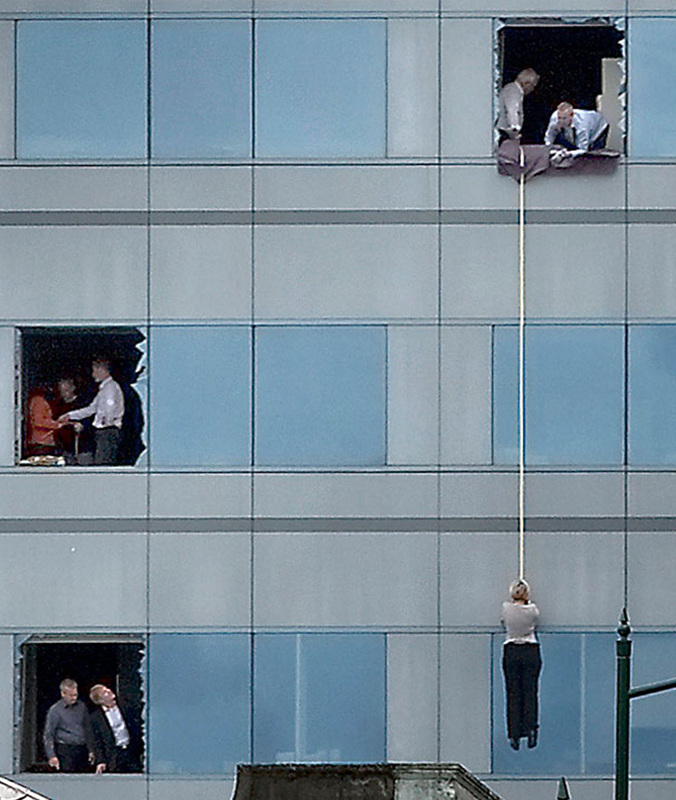 An occupant escapes Forsyth Barr after egress stair failure. 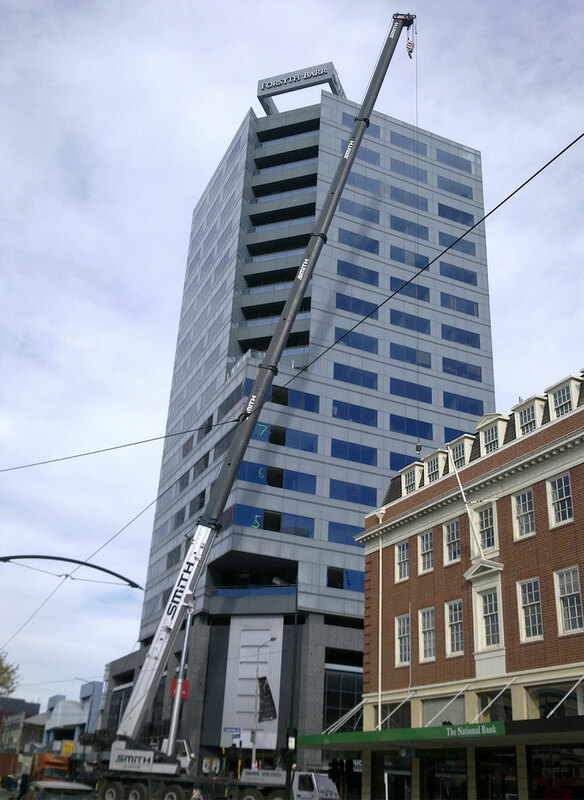 Forsyth Barr occupants were eventually rescued by crane. Another topic that is not covered in the TBSS report and warrants discussion is building instrumentation for seismic monitoring. Seismic monitoring measures building displacements during an earthquake through accelerometers installed at strategic locations within a building. Lateral displacements caused by seismic events are the primary cause for structural damage in buildings. Data gathered from these instruments can be used with the above-mentioned analysis models to evaluate a building’s likely performance and locations of potential damage. Armed with this information, post-earthquake inspectors can more efficiently target and prioritize inspection locations for these tall buildings, ultimately speeding recovery efforts. Questions regarding structural integrity can be a significant impediment to speed of recovery, and many can be answered through the results of seismic monitoring. Owners of existing tall buildings should consider installing seismic monitoring equipment to speed the post-earthquake recovery of their building and reduce the impact to their tenants. San Francisco currently requires the instrumentation of newly constructed high-rise buildings through Administrative Bulletin 058 but has no requirement for the instrumentation of existing high-rise buildings. The City should consider augmenting the TBSS by extending the requirements for building instrumentation in AB-058 to include existing high-rise buildings. Some precedent exists here as the City of Los Angeles requires the instrumentation of select existing high-rise buildings in Section 1613.10 of the LA Building Code. Have questions on preparing your tall building for an earthquake? Reach out to Dan Bech, Principal with Holmes Structures. 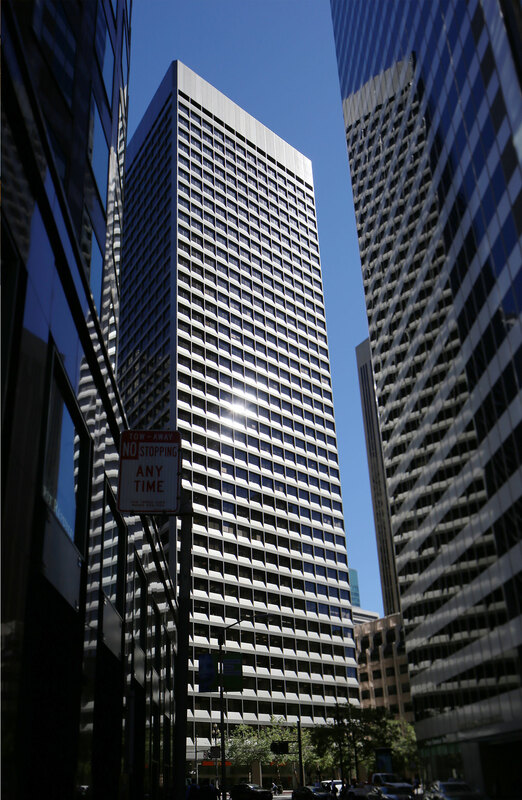 425 Market, a 38-story building in San Francisco’s Financial District, is an example of how to prepare a tall building for an earthquake. 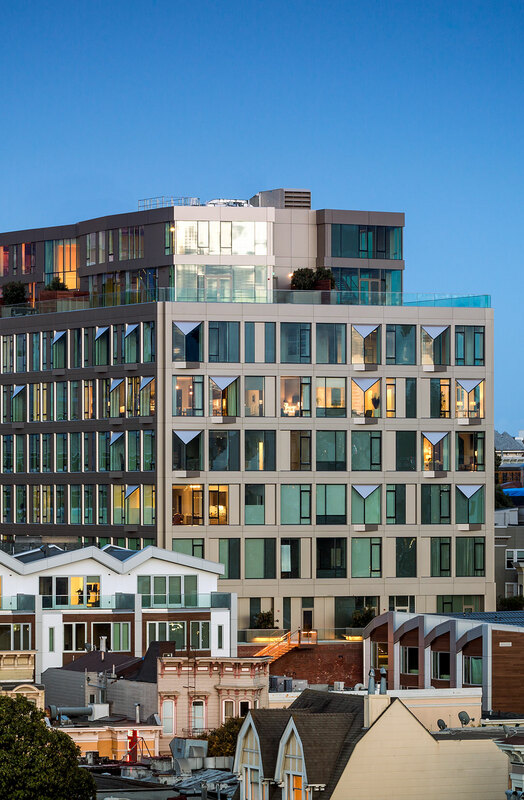 The client engaged Holmes Structures for the award-winning retrofit of two egress stairs, full seismic monitoring, and the creation of a BORP (Building Occupancy Resumption Program) Plan. A firsthand account of being stuck in a building when the egress stairs drop out during an earthquake. 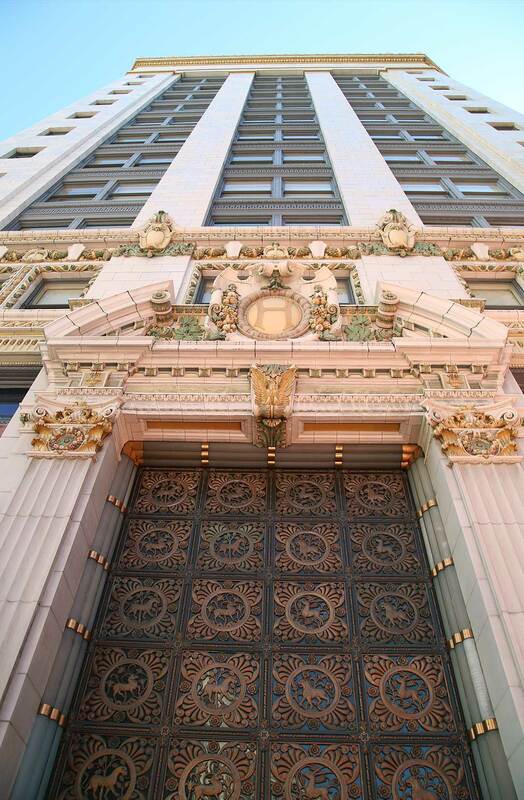 Holmes Structures won an Excellence Award for the retrofit of two 40-story egress stairs at 425 Market Street, a commercial pre-Northridge high-rise in San Francisco.